As customers are likely to do repeat business with a company that they are familiar with, this branded Chalk Tumbler In Double Wall makes a great reminder about your product and services. 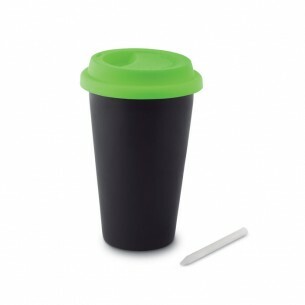 A double-wall drinking cup with a writable front surface, it comes with a silicone lid with sip hole. A perfect companion on coffee breaks or even while on the go, it can hold up to 350 ml of liquid. Our chalk tumbler in double walls are made from ceramics and is available in white. The main print position on this product is the front. Please chat to us if you would like to use another position. Our tumbler items are printed in up to 4 colours via pad print, which is a technique suitable for almost all artwork and shapes.